For $500, you can celebrate at "The Green Inaugural Ball: Maximum Celebration, Minimal Impact." January 13, 2009, 1:51 p.m. So many green inaugural events, so little time! Not one, but two green inaugural balls are planned in Obama’s honor. 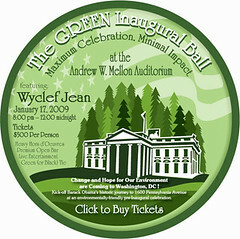 One of them — “The Green Ball: Inauguration of a New Green Economy” — boasts Al Gore as the host; the other — “The Green Inaugural Ball: Maximum Celebration, Minimal Impact” — features Wyclef Jean and is open to the public! Since most of us weren’t invited to Gore’s ball, I’ll focus on the “Maximum Celebration, Minimal Impact” ball, which any of us can get into for $500 — five percent of which will be donated to the nonprofit sponsor of your choice. Happening Saturday, Jan. 17 at the Andrew W. Mellon Auditorium, the ball features local and organic hors d’oeuvres, an open bar, and live entertainment — as well as many other green details outlined on the ball’s solar-hosted website. Can’t afford to go to the ball in this economy? If you’re in L.A., you can take in the “Inaugural (EV) Parade West: Plug In, America!,” a parade of electric vehicles happening on the morning of Jan. 17 in Santa Monica, Calif.
Or celebrate Obama’s inauguration with your morning cup of coffee! Yep, there’s now a President’s Blend: Coffee for Change, an organic, fair trade limited edition coffee blend made of beans from East Africa and Indonesia from Thanksgiving Coffee Company (via change.org). A 12-oz bag costs $11.